Une ancienne maison en pierre à 4 mètres de la mer et une promenade à Kotor. Cette maison fortifiée du 18ème siècle est notre maison de vacances qui a été restaurée à notre goût. Les 12 ports de mousquet ont été fouillés et éclairés et, bien que l'une des plus grandes maisons de la baie, nous avons évité de la diviser pour un revenu locatif maximal. Il y a quatre chambres à coucher généreuses, deux salons, une dans le loft double hauteur, et une cuisine faite main avec des appareils Bosch. Il y a TV, câble, et wifi dans le loft et Benath les carreaux de calcaire, chauffage par le sol. Il y a aussi un jardin en terrasses à l'arrière et des marches dans la mer à l'avant. Muo est un ancien village de pêcheurs avec un magasin, un quai et un restaurant. Kotor est une promenade le long du front de mer. On peut nager au-delà des voiliers matés sur le quai ou remonter la montagne sur d'anciens chemins. Notre espoir est de donner aux clients les meilleures vacances possibles à un prix raisonnable. Muo and the property were not either comfortable nor enjoyable. I know that the owner of the property made a very great effort, but the result was quite shy of success. Malcolm arrived presuming a full time maid would be provided. It was soon clear he had never used a cooker - or other household appliances.We arranged all his travel to and from Dubrovnik and within Montenegro during a conversation of over 80 emails. I'm sorry Malcolm was unable to appreciate the beauty of a place I love, or the genuine concern shown him throughout his stay. I am also sorry that when it became clear he could not cope in a self-catering house, he declined our "kind offer" of money back and help in finding a hotel. He said his stay was and continues to be enjoyable. We just returned back yesterday from our trip and we are already wishing we were back in Muo. We had a wonderful time and so much of it had to do with where we stayed. Nick's house is amazing. The location cannot be beat! For those that don't like to drive on tiny roads though, be warned, this road is not for the weak of heart! But it's all a part of the adventure, right? The road does make things a little noisier than expected but that can't really be helped. Every morning, the view took our breath away! And it was a quick walk into Kotor as well. Nick gave us a bunch of wonderful restaurant suggestions that were off the beaten path - thank you! 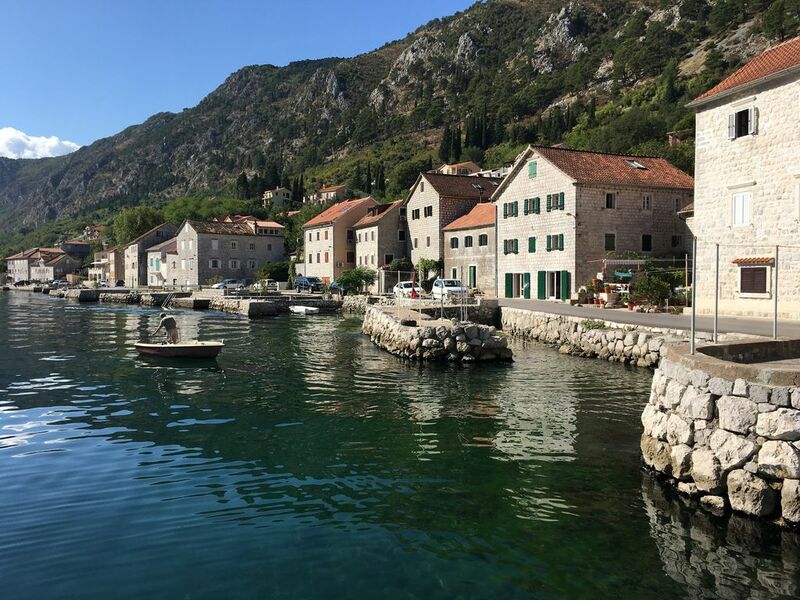 We hope to make our way back to Montenegro again and if so, we would definitely stay here again! Hi Julie. You were a pleasure to accomodate and I'm so happy you liked the view, the house - and the restaurant suggestions. We would be delighted if you were to visit again. We loved our stay. The house is great with plenty of space. Looking out over the bay is amazing and you never tire of the view. The road at the front of the house was a lot busier than we thought it would be which made it a bit noisy at times but other than that it was perfect. Kotor old town was a 15 minutes walk. Very stylish living by the sea! Beautiful home in a great location. Comfortable beds, loads of space, well appointed with the necessities.